This unusual and interesting surname has two origins; firstly, it may be an Anglicized form of the Gaelic O hAinmhire, the prefix "O" denoting male descendant of, plus "Ainmire" meaning freedom from levity, from "mire", levity. Secondly, it may be of Anglo-Saxon origin, a locational name from the places called Hanbury in Staffordshire or Worcestershire, which derive from the Olde English pre 7th Century phrase "aet thaem hean byrg", at the high fortress. In some cases it may also be from Handborough in Oxfordshire, which is apparently so called from the Olde English byname "Hagena", hawthorn, plus "beorg", hill. 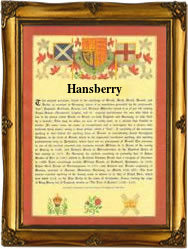 The surname dates back to the late 12th Century (see below), and variations in the spelling of the name include: Hanbury, Hanburry, Hansbury, and Hansbery. Church Records list the marriage of James Hansberry to Johanna Kivill, on January 19th 1851, at St. Martin in the Fields, Westminster, and the christening of Michael, son of Pat and Mary Hansberry, on August 26th 1865, in Tuam, Co. Galway. The first recorded spelling of the family name is shown to be that of William de Haneberge, which was dated 1196, in the "Feet of Fines", Staffordshire", during the reign of King Richard 1, known as "The Lionheart", 1189 - 1199. Surnames became necessary when governments introduced personal taxation. In England this was known as Poll Tax. Throughout the centuries, surnames in every country have continued to "develop" often leading to astonishing variants of the original spelling.